So this is what we all do wrong a lot: we use hyphens to separate sentence clauses. The man – the one wearing blue – got off the bus. Wrong dash! I tend to prefer good old commas for this but you can use dashes but not hyphens. 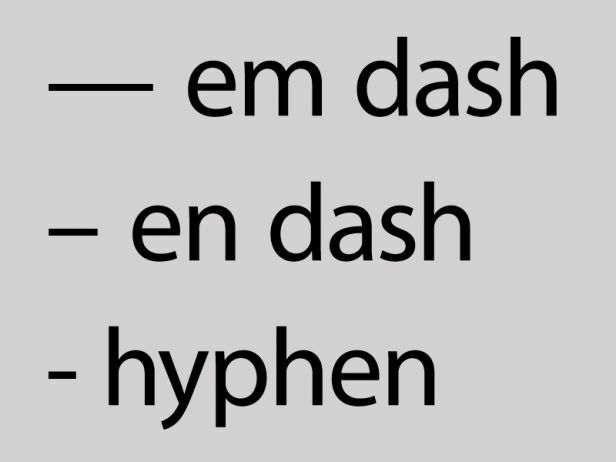 The one I prefer is the spaced en rule or the en dash. The man – the one wearing blue – got off the bus. Type word no space hyphen hyphen (one doesn’t work) no space next word and now when you add a space see what it does to the dash! Or short cut control-alt-minus sign in number panel — no spaces here remember. The man—the one wearing blue—got off the bus. Care with the latter use to invert the closing speech mark or type “But” and then go in and add in the em dash or the speech mark is the wrong way round. Hyphens (the short dash) ‘-’ are only used to break words like twenty-five, run-on, ice-cream (can be without too) or a three-year-old child etc. Got it! Here endeth one of my short copy editing notes! More to come over the summer!